My early schooling was in Maths and Physics and from an early age I was steeped in the world of engineering, my father having been a very successful mining engineer. Music was never far away however as my mother was an accomplished pianist and my father came from a line of Eisteddfod singers, although he didn't pursue this himself despite having a fine voice and a talent for the mandolin in his boyhood. Guitar making was not my first career choice; my schooldays were preparing me for a career in aeronautical engineering but a teenage flirtation with pacifism led me to switch to studies in psychology. An unexpected reversal of fortune in the break up of my parents' marriage forced me into the breadwinner role and the abandonment of academia in favour of more practical and immediate rewards. I set about making a living as a commercial sculptor making elaborate designs for giftware and jewellery manufacturers (exploiting a talent for miniaturism that I had spent my childhood honing) while at the same time pursuing studies in guitar making at the recently opened (but now sadly defunct) Welsh School of Stringed Instrument Making, partly funded in the first year by a technician's job based at the college paying the princely sum of £25 a week!. How I came to be there is a story of serendipity and synchronicity. Never got to build my lute though. 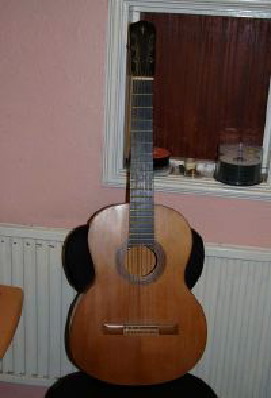 Although I was ostensibly training as a guitar maker (I chose to build flamenco guitars as I didn't have the money to buy tuners and peg heads were cheap!) it soon became apparent that with my hard science and engineering background my skill was for fixing stuff and solving problems which the largely arty-crafty types that the school attracted found beyond their ken. I rapidly became the person who could answer the questions that everyone else had about how to calculate the correct positions of the frets, why certain things wouldn't work as expected, and this was where my fascination with tuning, temperament and the nuts and bolts of how the things worked came from, helped by the fact that one of my tutors was Bernard Richardson of Cardiff University, one of the worlds leading researchers into the physics of the guitar. The band "Gong" were pretty popular with the post-modern hippy, magic-mushroomy types that comprised about 70% of my fellow students and I soon became the "Octave Doctor". Another of my tutors was the harp-maker Allan Shiers. A former missionary, locksmith and shipwright, a genuine multi-skilled renaissance-man and a humble and generous teacher, Allan taught us not how to make guitars but how to engineer the things that enable guitars to be made; how to apply tools to shape materials and use the properties of the materials to their best effect. The ability to make guitars then became just a subset of making anything else and followed quite naturally from the basic skill set. Until then, I had seen tools as something other people made and which I used. Later in my career my tendency to conduct successfully improvised repairs using tools I made myself from everyday objects like coat hangers and shoelaces earned me another nickname; "the real McGyver". After Hohner I moved into retail as the resident repairer at Cranes of Cardiff, one of the countries best known music shops, where I stayed for nine years until finally going fully freelance with a workshop above GM Music in Newport. In 1998 Sound Control opened their Bristol premises and I was quickly recruited to set up a satellite workshop in their shop in Rupert St. The Bristol area demographic increasingly occupied my time for the subsequent nine years but sadly all things change and Sound Control went into administration in April 2008. The Bristol shop was acquired first by Reverb and subsequnetly by PMT, however my Bristol workshop is now hosted at the neighbouring premises of Mickleburgh Pianos and I currently divide my time between working at home on my design and administration work (I have another three hats as a digital retoucher, sculptor and basic website designer) and my two satellite workshops in Bridgend and Bristol. I have a simple business philosophy; click the link to read about it.